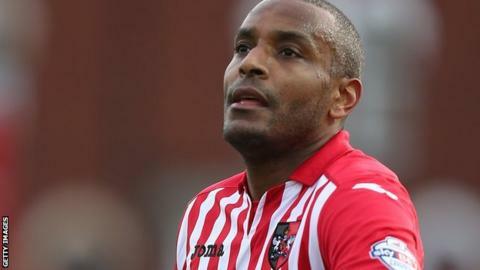 Clinton Morrison says he is "desperate" to get his first goal for Exeter City. The former Republic of Ireland striker recently signed a new contract to remain at St James Park until January. But the 36-year-old is yet to score in 30 appearances since joining Exeter in November 2014 and he told BBC Sport: "I desperately want this goal. "My game has changed over the years. I'm not as prolific as I used to be when I would score 25 goals a season, but I want goals." Despite failing to find the net for the club yet, Morrison's contribution has not gone unnoticed by Exeter boss Paul Tisdale. "If we win games, I don't care who scores," said Tisdale. "He's been a good contributor to goals we've scored, albeit in assists and link-up play." Morrison first joined Exeter on non-contract terms last November before signing a permanent deal in January. And after initially agreeing a deal until the end of August, he will now stay until the midway point of the season. "I'm in the right positions, I think I'm fitter and I just need the ball to drop for me," added Morrison, who has spent time at Crystal Palace, Coventry City and Birmingham City. "I just need one, regardless of how it goes in. I could slip over and it could hit my backside, I'm not bothered. "But I am due one soon. It is very frustrating, I might not show it because I'm not that type of guy, but deep down it does burn me."